We’re kicking off March with an incredible money-saving deal for this Ink Fridays™. Our deal of the week is: 90% Off Brother (Pack of 4) Compatible LC103 High Yield Ink Cartridge Replacements. This means at a price of $5.95 per combo pack, you can buy each cartridge for only $1.49 each . When we take a look at the retail value of $63.68, you'll see we’re giving away $57.73 or 90% in savings! As always, we enjoy sharing exclusive deals with our readers, this offer runs this week only on March 6th through midnight (PST). 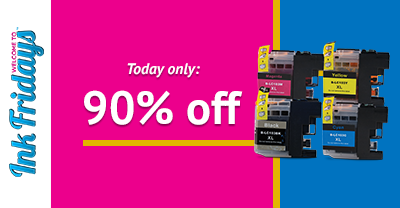 Shop now for 90% off Brother LC103 compatible high yield ink cartridge before time runs out! Wondering if your Brother printer is compatible with our week's special offer? You may visitor our site to check compatibility, or you can also look at the list below to see if your printer is listed. If it's there, your printer is compatible with our compatible Brother LC103 ink cartridge combo set! Is Your Brother Printer Listed Below? Don't Want to Miss Out on Ink Fridays™? We love giving out special deals to our customers, and Ink Fridays™ is just one way we show our appreciation. If you'd like to stay up-to-date with every week's offer, sign up to our Ink Fridays™ newsletter or follow us on Facebook to see our weekly offer. So if you don't see your ink or toner cartridge this week, you might just find it during our next Ink Fridays™. And remember, you still have time to take home a Brother (4 Pack) LC103 compatible high yield ink cartridge set for only $1.49 each! Click here to check out the offer before it expires at midnight on March 6th. Can A 3D Printer Be A Vital Part Of Our Lives? Our Spring March Logo - Love it or Leave It? Will 3D Printing Pen Become a Household Staple?